in gauge given in 1x1 ribbing, cable gauge in pattern. Based on final fabric. 17(19)" around, to fit an 18(20)" head. After knitting Beekman Tavern, I still wanted to do more with Foxhill Farm’s gorgeous Cormo yarn. The design is named for Buck - the sheep that Alice (who runs the farm and is the heart and soul of the operation) has told me gives his fleece to make this perfect gray shade. It’s all about deep, rustic texture with Buck’s Hat. It features a classic basketweave cable - with a little texture added. The subtle sheen and perfect gray of the fiber really pop in the detail -- and when knit in these cables, the squishy luxury of the yarn is just perfect. I think this hat is also hugely versatile - it works for a man or a woman - and could also rock a pom if you wanted to add one. 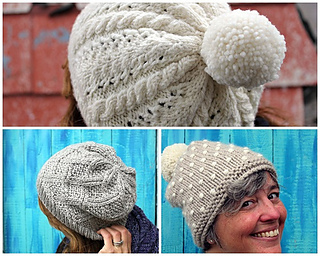 If you prefer your cormo in another weight, check out Daisy’s Hat in Worsted or The Polka Knot hat in Bulky!